¡Hola! It’s Karlie and Jess! Wednesday was our first day of the week sleeping in– sipping coffee and eating breakfast on the balcony until 9. 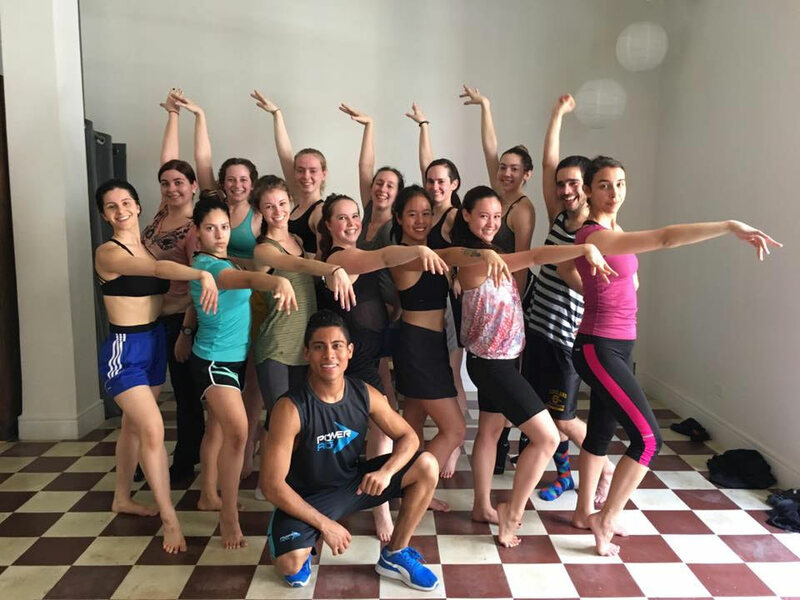 Our relaxed and savory morning was followed by a rigorous, high-speed Salsa class from Tony, a World Champion in Salsa Dance and a Native to Panamá. We then had a little time to wander the streets of Casco Viejo and explore local shops and stands. Earrings, pants, and paintings were just some of the purchases made during this small excursion. Sweaty as can be, we all returned to the hostel and enjoyed a lunch consisting of rice, beans, salad, and chicken. After finishing lunch, we boarded the bus for yet another thrilling ride with the one and only Rene, and spent the afternoon teaching at Malambo Orphanage. The older group (ages 10-18) was taught by Angela, and the younger group (ages 5-9) was taught by Gloria. Angela’s class was a modern-dance technique inspired workshop that consisted of flocking exercises and advanced lifts. Meanwhile, Gloria was teaching a creative movement class for the excited and energetic little girls of Malambo. That night, we drove home on Rene’s bus singing Latin pop songs at the top of our lungs, and later many of us went out for tacos, experimenting with different meats and sauces we had yet to ever try. At the restaurant, we played an intense game of pool, practiced Spanish with our waiters, and afterward, went out dancing for several hours in downtown Casco Viejo. It was truly a wonderful day. A day beginning with dance, ending with dance, and overall saturated with the pure joy of exchanging movement.